5. (Hey You) What'S That Sound? Les Rythmes Digitales harks back to the 80s in this faux French electronica album. Using the technologies available to the late 90s they make a pretty fun album which goes beyond bad taste and becomes a parody of its style, hence becoming pretty nifty in the process. If there is anything particularly great about this album it is the fact that it makes you want to put on a wife-beater and some leather trousers and boogie on down to the nearest gay bar. It is just that infectious. It might really not be your kind of music, but it is hard to be unmoved by the music, dancy and fun like most electronica albums haven't been since the late 80s. The tribute to a lost era is even reinforced by having Nik Kershaw sing in one of the tracks! Oh and only a very tongue in cheek disposable dance album would reference Soft Machine and Kenneth Anger in the same track! 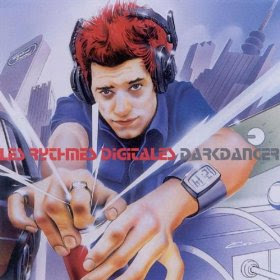 After British electronic musician Stuart Price, the sole member of Les Rythmes Digitales, began to gain attention for his collaboration with artists such as Madonna, Darkdancer was re-released on 5 September 2005 in the UK as a dual CD/DVD set that included some unreleased songs, song remixes, and the videos for "(Hey You) What's That Sound?" and "Sometimes". Can you see the Britney Spears's album coming your way mate? Congratulations to you if you can go through just one listening.. I did but asked for a bullet in my brain. By the way ,do you remember the lowest mark you gave to an album so far?